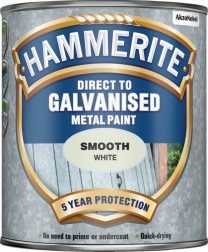 Hammerite Direct to Galvanised Metal Paint is specially formulated for application straight onto non-rusting metal, such as galvanised steel, aluminum, copper and brass, as a primer and topcoat in one. 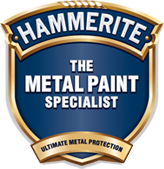 Available in six popular colours, Hammerite Direct to Galvanised Metal Paint enables you to create the look of your choice and, with its one coat application, painting these tricky metals has never been quicker or easier. Can be applied direct to galvanised surfaces with no need for a primer. A glossy, smooth finish for non-ferrous metals. Hammerite Metal Paint can be used for all kinds of metal, like railings, garden furniture and pots or even a balcony. It is not only an excellent way to protect your metal objects, you can also lift the look of them. Remove all loose rust and flaking paint from the metal using a wire brush. If the metal was already painted, wash down thoroughly with diluted detergent, rinse with clean water and allow to dry. 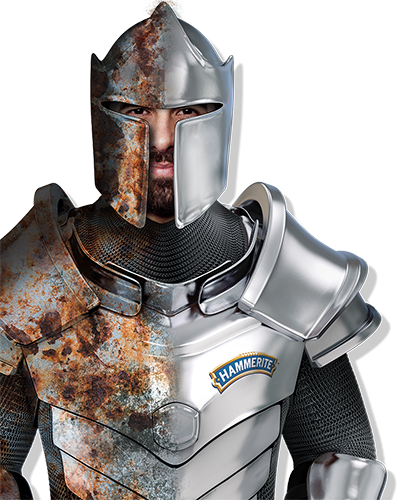 To ensure compatibility, apply a small test patch of Hammerite Direct to Rust Metal Paint Smooth Finish to the painted surface. Any reaction will occur within an hour. If a reaction is evident, remove all paint then wash down with degreaser. Rinse with clean water and allow to dry. If the objects are made from bare zinc, aluminium or galvanized metal use Hammerite Direct to Galvanised Metal Paint. For smooth metal surfaces, lightly abrade for maximum adhesion. Cover the surface beneath the metal object with thick newspaper or a dust sheet to catch any spills or drips. Stir the paint thoroughly before use, and apply with a good quality brush. A narrow brush is best for use on railings. A broad is best for use on bigger metal object, like a garden table. Apply two thin coats of Hammerite Direct to Rust Metal Paint in Smooth finish for the best results, leaving to dry in between as per instructions on back of pack.